I’m not going to take this lying down, but am using all kinds of foods to my advantage! Of course it helps that I try to minimise my exposure to toxins (such as additives in foods and BPA and other nasties in plastics and tins, etc) and eat a balanced diet. It doesn’t matter how many superfoods you eat if you also put frankenfoods into your digestive system. Hippocrates was trying to tell us something along these lines, too… That we should nourish our bodies every step of the way; not just save superfoods for when we are sick, but keep them in our diets regularly as a preventative measure. Eat your medicine (food-medicine not drug-medicine, that is) when you’re unwell but more so when you are well, because if it can nourish you back to health then it can help keep you healthy in the first place! So, in an attempt to give my body the extra boost it needs at the moment, I have done a few things. First of all, I have upped my Green Smoothie intake (mostly just for the energy!). I’ve also started doing Rural Spin’s Cayenne Shooters – these sure are interesting! I’m not so brave, though, and I reduced the cayenne a bit and put loads of honey in. I’ll work my way up to the full dosage. And for breakfast this morning, I made a super delicious, super beneficial superfood porridge based on The Alkaline Sisters’ Chia Porridge. If you haven’t checked out The Alkaline Sisters, I strongly recommend you do. Fabulous recipes (mostly raw), and gorgeous pictures as well! The Alkaline Sisters provided the inspiration for my tweaked and converted Raw Dark and White Choc Truffles, too. Some seriously yummy stuff over there. 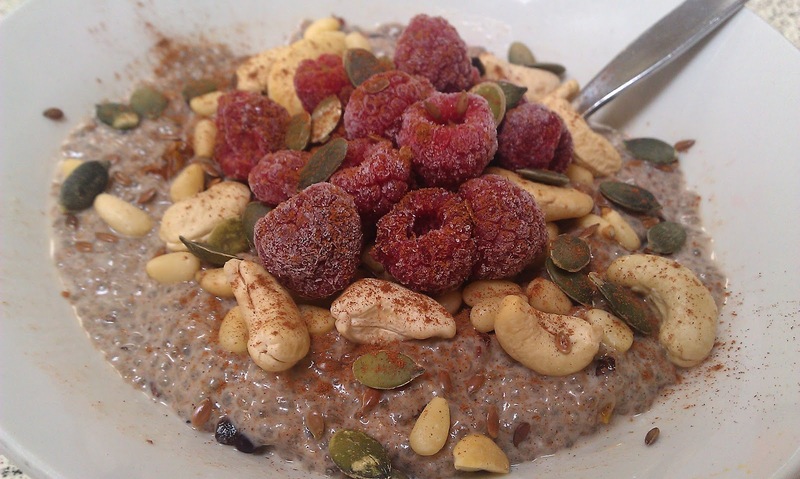 I came across their Chia Porridge recipe while browsing the blog, and thought it was a marvellous idea. Packed with goodness, gluten free and dairy free, and so easy! But I wanted to give it more of a punch, in the way of superfoods. We all need a bit of a superfood booster every now and then (I need it more often than I do it), and this is a great way to get in a variety of superfoods because it’s just so yummy! This porridge will become a regular breakfast for us now, not just something I whip up when I feel unwell. I have been thinking about the leftover porridge all evening, even while I was cooking dinner! I keep having to tell myself to wait until tomorrow morning, but I’d love to eat it for dessert! Tyler, my almost-four-year-old, absolutely inhaled his bowl this morning. He loved it so much, and just couldn’t get it in quickly enough! 1) Weigh almond milk and chia seeds into TM bowl. Immediately mix for 20 seconds on reverse, speed 3 so as to avoid clumping. 2) Add incaberries, goji berries, cacao nibs, honey, cinnamon, nutmeg, cardamom and vanilla to TM bowl. Mix again on reverse, speed 3 for 30 seconds. 3) Let porridge sit overnight in the fridge to allow the chia seeds to soak up the almond milk (don’t skip this step; you really won’t be happy if the chia seeds soak up all the juice in your digestive system instead!). Soaking overnight is not only fantastic if you’re low on time in the mornings (make it the night before and pop it in the fridge ready to go as soon as you’re up and about), but an overnight soak is also going to lead to optimum digestion and availability of nutrients. The chia seeds will absorb all the liquid in approximately 45 minutes, but as with any soaking – the longer the better! 4) When serving, sprinkle a small handful of each suggested topping on top for extra flavour and extra goodness! Or get creative, and throw on anything you can think of! * denotes that that particular ingredient is on at least one of the many ‘superfood lists’ floating around the internet. If you add it up, there are TEN superfoods in this porridge recipe! That is certainly a good dose of superfoods. I haven’t listed all the benefits of all these superfoods, but if anyone is interested then I will absolutely do so. But together they provide a very comprehensive combination of antioxidants, vitamins, minerals, fibre, omega-3 and omega-6, proteins, amino acids, etc etc. Can you use chia powder for this I don’t have any berries. have you ever thought of using the choc-cashew-cardamon milk instead of almond milk? well i did 🙂 just reduced the amount of honey and added 200ml choc-cardamon and 300ml hazelnut milk and it is amazing. But of course i now have to wait for lunch before i can eat it.